In Priscilla’s case, a “change in the patient’s condition” was first noted in July 2015. She then did die of respiratory failure, but not within the next 24 hours. It took six months. Still, Priscilla would spend all day just trying to catch her breath. It required 20 or more gasps to get that “caught up” feeling, and she would soon run out of breath again. Imagine running as fast as you can for as long as you can, pushing to the limits of your lung capacity until you collapse on the ground, gasping for breath. That’s how short of breath Priscilla felt all the time. Yet still she hung on to life. These were horrible days. I can’t put it any other way. Yet God’s mercies to us continued. In fact, some of the most direct assurances we had of God’s continuing love and presence came during this most desperate part of our journey. Friends who lived in other parts of the world started appearing in my dreams at night, right around the time when they would be getting up and remembering us in their morning prayers. Friends in the United States and Canada showed up in my dreams, too, and these were people who’d told us that they prayed for us in the night if they ever woke up. Some of them reported waking up regularly at specific times, such as 3:00 a.m. I believe God was reassuring me by showing me in my dreams that He had us covered by prayer around the clock. One night in a dream I visited with another friend who was already in heaven. I’d known him on earth as a godly older gentleman. It eventually dawned on me that he’d been a widower, so he knew just what I was going through. I truly believe that God gave him a special assignment to pray for me in those days, because he could do so with compassionate understanding. These dreams encouraged me to recognize that praying friends on earth surrounded us in this deep trial with their love and care, remembering us continually before God along with a throng of those who were already in God’s presence. This awareness gave us the strength and hope we needed to carry on. Her gasping for breath, amplified by the VPAP, became so loud that it began to keep me awake at night. I moved, very reluctantly, down the hall to sleep in the hospital bed, just so that I’d have enough energy to make it through the next day. But my ears were attuned to the sound of her voice, so that in my sleep I could still hear her call me, even faintly with a breathing mask over her face, whenever she needed help. In the summer of 2015, Priscilla’s neck muscles weakened to the point where she could no longer hold her head up on her own. She now needed what’s known as an “all-encompassing headrest.” This would keep her head from painfully and dangerously falling forward or to the side while she was sitting in her wheelchair, or to the back when she was being transferred in or out. We worked with our mobility specialist to determine what model would be best for her. An all-encompassing headrest, the model we wanted for Priscilla. Our indomitable case manager was once again able to help expedite the process for us. Thanks to her efforts, our medical insurance approved coverage the same day our doctor faxed them a prescription. But when our mobility specialist received the headrest from the manufacturer, it had no hardware to attach it to the wheelchair. So he would have to see whether he could find some that would work. Around this same time, after 14 months of continuous use, the battery for Priscilla’s power wheelchair stopped holding its charge all day. We recharged it in the afternoons while she was resting in her “day bed,” but we knew it would soon stop working entirely. Then she would either be stranded in bed, if we knew before she got up that the battery was gone, or else stranded out of bed, because the power “tilt” feature was indispensable for positioning a sling under her to transfer her in and out of the wheelchair. Under other circumstances, we would have had to bring or send the chair for servicing to a company in a different city, forcing Priscilla to stay in bed for who knew how many days. But we asked our mobility specialist whether he might be able to install a new battery when he brought over the headrest, once he found some hardware for it. This was outside his usual responsibilities, but he was willing to help us out by doing this. The only catch was, the supply company would have to get insurance approval for the battery. Somewhat desperately, since Priscilla was facing a real risk of injury without the new headrest and immobility without a new battery, we emailed our Dear Praying Friends and asked them to pray with us that the specialist would be able to find some headrest hardware, and that the company would apply for and receive insurance approval for the battery as quickly as possible. This was on a Saturday afternoon. We had no idea how long we might have to wait for these things to happen. But on Monday morning, the specialist called to ask whether he could come with the headrest and the battery in one hour. He explained that he’d been able to pull some perfectly matching headrest hardware off a demonstration model wheelchair that his company had in its shop. They’d also approved him delivering and installing the new battery even while they were still waiting for insurance approval. Such a thing had never happened to us before, in our extensive experience with the medical system. And so Priscilla got an all-encompassing headrest for her wheelchair that made things much safer for her, as well as a new battery that enabled us to use the chair all day long without being concerned about running out of power. We reported this news to our Dear Praying Friends, and one of them suggested that perhaps the headrest was delayed by the missing hardware so that the the mobility specialist could bring the battery along with it, saving us the trouble of sending the chair out. This may well have been the case. The new headrest provided the support Priscilla needed when she was in the wheelchair. But because of the weakness in her neck muscles, her head was also at risk of snapping dangerously from side to side when I rolled her back and forth in bed to put the sling under her or to remove it, or when I was transferring her between the wheelchair and bed (when she no longer had the support of the headrest that was attached to the wheelchair). And so at the same time we started looking into headrests, we also began to look for a device that would protect Priscilla under these other circumstances. Our nurse practitioner had previously worked in a surgical unit and when we asked her about this, she knew just what to get: a two-piece collar that was held together with Velcro. I could slide the back behind Priscilla’s neck, whether she was in bed or the wheelchair, and then attach the front tightly so that she’d be safe. This device, too, was delayed, not by missing hardware, but by inaction on the part of a different medical supply company that agreed to send us one. Though we prodded the company frequently, a month went by without anything being delivered. When our nurse practitioner found out about this, she told us she was “going on the warpath.” The collar arrived within days. We saw these new assistive devices as more “friends” for Priscilla that would enable her to keep doing what she wanted to do. But clearly they weren’t the only friends who were helping her hold her head high. We’d seen once again through these experiences that we were surrounded by people who loved her, prayed for her, and did everything they could to help her. We made a point of counting our blessings at bedtime, and there were always plenty to count. The style of collar Priscilla needed to wear during transfers. Now that Priscilla could barely use her right hand any more, we took the extra leaves out of our dining room table to make it a small circular shape. She reclined in her wheelchair parallel to one of the places, and I sat just off her right shoulder at the next place around the table. For a while she could still grasp a fork or a spoon, and this seating arrangement allowed me to help guide these up to her mouth, so she could do “as much as possible for as long as possible” to feed herself. But the day came when she realized that she could no longer even hold onto a spoon or fork, and that I would simply have to feed her. She sat sadly and silently at the table, trying to process this reality. She was moving yet farther into helplessness and dependence. I could tell that it was a dignity issue for her. But at that very moment, a pair of cardinals flew onto our back deck. As we watched through the glass doors, the male perched on the bird feeder, while the female stayed a short distance away on the deck rail. The male gathered seeds in his beak, hopped over to the female, and put them in her beak. “Well,” Priscilla said, “if Mrs. Cardinal can let her husband feed her, I can let my husband feed me.” The scene had enabled her to break through the barrier and find what Amy Carmichael calls “peace in acceptance” of her new situation. It was a tradition for me to buy Priscilla annuals for her deck flower boxes as a Mother’s Day present. I didn’t do this in 2014 because, frankly, we both though she would die before the flowers did. But when she kept outliving estimates of her life expectancy (people eventually stopped offering these), she finally said, “Let’s just make the best of it,” meaning life with ALS. So for Mother’s Day 2015, I picked up some red, white, and coral geraniums and planted them in the flower boxes where Priscilla could enjoy them each day. The weather was unseasonably warm that fall, and by covering the flowers on the first few frosty nights, we were able to enjoy these well into November. But that was still outside the window. I thought it would also be nice for Priscilla to have some flowers she could see and smell from up close. She loved her peonies, but as they were planted in the front gardens, she never got to see them any more. So I cut some and put them in a vase so she could enjoy their beautiful shape and color and their rich fragrance, which filled our house. Unfortunately, this first bunch turned out to be the last one available from our gardens, as an unusually warm and wet June made the peonies bloom and fade much earlier than normal. But when this bouquet was just about past, a friend who knew nothing about any of this called and said she had something she’d like to bring over for Priscilla. It was large and beautiful arrangement of peonies, in various shades, from her own garden! We concluded that God wanted to help us “make the best of it,” too. One evening in the summer of 2015, as I was looking ahead to the next day, I realized that I needed to make a new batch of muffins for our breakfasts. (Muffins from the store or bakery tended to be too high in fat and sugar, and they were also more sticky and could block Priscilla’s throat.) As by then I was fighting fatigue all the time, I asked myself, “Where will I ever find the strength to make those muffins?” But that same evening I got an email from some good friends in Ontario (the couple whose family had winterized our gardens in one weekend) saying that they’d be traveling right past our house the next morning, and that they’d made a batch of our favorite muffins that they’d like to drop off with us! They were able to visit with us for a few minutes and we had a grand time laughing and joking together—a great time of encouragement. God had sent us exactly what we needed, when we needed it, by the hands of good friends. Priscilla had to state her name and date of birth, including the year, for identity verification every time health workers gave her medication. Visitors sometimes overheard this, so it became no secret that she was going to turn 60 in the summer of 2015. Our church made her a big birthday card, with everyone’s signatures and good wishes on the inside, and an original watercolor by her artist friend on the front. She also received cards, flowers, fruit, and balloons from many other well-wishers on this occasion. A few days before her birthday, we had a special visitor. For the first and only time, a male rose-breasted grosbeak came to our bird feeder. This was just after we’d sat down to breakfast, so we could see him clearly right outside the glass door. This gorgeous large bird perched there contentedly for over an hour. Priscilla was transfixed with wonder and admiration, moved nearly to tears by the beauty of the creature. A day or two before this, somewhat playfully, but also with a bit of curiosity, I’d asked God whether He’d thought about what He wanted to give Priscilla for her 60th birthday. Clearly He had. 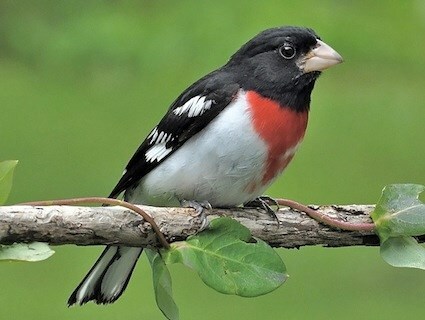 Rose-breasted grosbeak. Photograph copyright Gary Tyson. Taken in Tioga County, Pennsylvania, June 2010. — From an email to our Dear Praying Friends, June 2015. In the spring of 2015, even though Priscilla’s breathing remained stable enough for her to stay in regular home care, her condition progressed in other ways that posed continual new challenges for us. For one thing, her neck and shoulder muscles became too weak to hold her head up. To do lift transfers, we had to put a stiff plastic insert in the top of the sling for support. As a result, we had develop routines for each kind of transfer all over again, because the sling was no longer behaving in the ways we’d become accustomed to. Within a day of sending out this request, I had an insight. I’d been saying somewhat jokingly that I really needed three hands: one to keep the sling folded; another to position the sling; and a third to hold Priscilla on her side and keep her from falling off the bed (because that’s not how we wanted her to “get out of bed” in the morning!). I realized I could use the large clip that held our quilt onto the blanket lifter at night as a “third hand,” to keep the sling folded for as long as necessary. Things started working much better after that, though for a while each lift was still an adventure in mechanics (and in faith and trust, on Priscilla’s part). Her right hand, one of the last parts of her body she could still move, began to stop working in the spring of 2015 as well. For one thing, this meant that she could no longer drive her power wheelchair. The mobility specialist recommended “attendant controls” that I could operate from the back. But our medical insurance initially denied coverage, on the grounds that I should be able to push her in a manual wheelchair instead. Actually, she would simply have fallen out of a manual chair, and she also needed to make regular back, seat, and leg adjustments, which the power wheelchair allowed, in order to remain pain-free and avoid sores. We contacted our insurance case manager, who was always a dependable and effective ally. She told us to appeal the decision, and to call her once we had. When we did this, she said, “Give me a minute.” She tracked down someone who had the authority to decide the matter, and that person granted our appeal on the spot! “I just want you to know,” our case manager told us, “that I’m in your corner.” She surely was, and it was great to have her there. Controls like these were added to the back of Priscilla’s wheelchair so I could drive it for her. From top to bottom they are for battery level, power, horn, mode [drive vs. position], and gear. The joystick controls speed, direction, and seat angle. Not having the use of either hand any more also affected Priscilla’s ability to do so-called ADLs (“activities of daily living”), such as washing her face, combing her hair, and brushing her teeth. We’d already introduced many adaptations so that she could keep doing “as much as possible for as long as possible” to accomplish these things on her own. For example, when she could no longer move a regular toothbrush up and down, we’d gotten an electric one that she could simply hold in place and let the bristles move. Instead of her leaning over the sink to wash her face with her hands, we’d worked out a system whereby she could use a washcloth and a basin while sitting back in her wheelchair. But now I had to start doing for her the things she’d previously done for herself with my assistance. Washing her face and combing her hair were pretty straightforward, with some coaching from her. I picked up other tasks, such as cleaning the VPAP mask after each night, without too much trouble. But as I stood in front of her with an electric toothbrush in my hand, poised to brush her teeth for the first time, she said to me, “You’re a brave man.” Eventually we worked out a mutually agreeable protocol for that ADL as well. What purpose indeed. How could it possibly advance God’s interests to have someone like Priscilla inexorably stripped of the power to use the creative and artistic abilities she’d employed so wondrously in His service, and to have her reduced into what felt more and more like utter helplessness? We struggled with these questions greatly during this season of the disease’s progression. In the end, we found peace and joy by making a choice. We chose to believe what our faith was telling us, that God did have a purpose for all that we were going through, even if we didn’t understand it now, and even if we never found out in this life what it was. Indeed, we recognized, God’s purposes are so vast and sprawling, and His time horizon so long, that no human being is likely ever to get more than a fleeting glimpse into a tiny part of them. So what made us think we could understand where all the details of our lives fit into this big picture, and how could we make understanding it a condition of continuing to trust God? We’d certainly had every indication that God was still with us, in the form of the help we’d received and the ideas we’d gotten for how to proceed under these new conditions. In the end, it all came down once again to trusting, enduring, and not being offended. We listened once again to the King’s College Service of Lessons and Carols on Christmas Eve, this time in its full musical glory on our sound system, instead of on the emergency radio we’d used the year before during the power outage. The next morning I surprised Priscilla by using our special Christmas dishes for breakfast. I’d secretly pulled them out of storage. She was moved to tears because she’d been wishing for some nice holiday touch like that, but she hadn’t wanted to ask me to do any extra work. A neighbor brought us a lamb dinner for that evening and some other friends brought us cinnamon rolls for the next morning. As a Christmas present, Priscilla gave me a book about the St. Albans Psalter, a beautiful illuminated biblical manuscript from the Middle Ages. We had several opportunities in the following days to sit together in the living room, winter sunlight streaming through the windows, and read aloud through the book, pausing to admire and discuss the many illustrations. These were timeless moments. 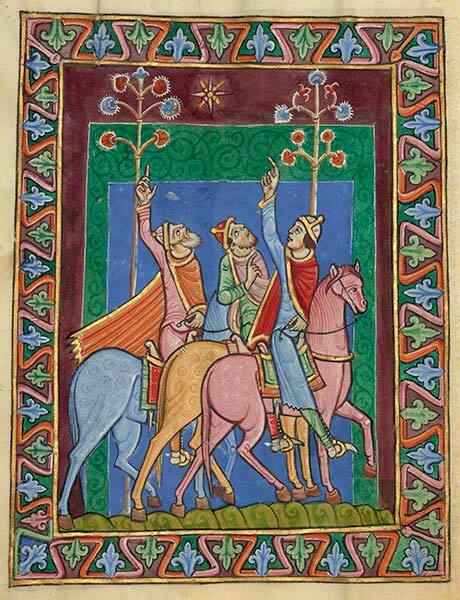 The journey of the Magi, from the St. Albans Psalter. On Monday, January 5, 2015, Priscilla entered a home hospice program. Three weeks later, she withdrew and returned to regular home care. Why? It simply wasn’t time yet, and that became apparent right away. The hospice culture, quite understandably, was geared towards patients who were near death, and who were therefore typically unresponsive or even unconscious. Priscilla, by contrast, was still willing and able to take an active part in decisions about her own care. And so there was a mismatch between the culture and her capabilities. Hospice caregivers would look at me and ask, “Do you think she would like such-and-such?” I’d turn to Priscilla and say, “What do you think, would you like that?” Then she’d answer the person herself. This would have been perfectly reasonable with an unresponsive or unconscious patient. But we had things we needed to get done pretty much every minute of the day, and we couldn’t afford to wait around while somebody charted. Nor did we want to leave a visitor in one room while we attended to responsibilities in another. We had to explain our situation to several different hospice staff to get them to chart somewhere else (back at the office, or in their cars) once they finished their actual work with Priscilla. It didn’t take long for the mismatch to become uncomfortable. When we explained the situation to Priscilla’s medical team, they understood and agreed that she should return to home care until her condition became much more limiting. And so, in the last week of January, Priscilla happily welcomed back her home care nurse and aide, both of whose schedules permitted them to add her as a patient once again. One good thing did come from her brief stay in home hospice. The agency sent over a physical therapist to do an evaluation, and he quickly determined that her shoulder, elbow, wrist, and finger joints were at risk of painfully locking up, as her lower-body joints had been earlier, because she wasn’t using them much any more. We needed to add upper-body range-of-motion exercises to her repertoire, and these helped her remain flexible and pain-free the rest of the way. As the physical therapist was teaching me these exercises, he kept saying, “I feel as if I know you from somewhere.” He asked a few questions about us, and when he learned that I’d been the pastor of a church in town, he exclaimed, “That’s it!” He and his family had attended the same church under my predecessor, and while they’d moved to a different one before my time, they’d always come back for Christmas Eve. He’d heard me preach on that occasion several times. When he explained this, I recognized him as well, from the greetings we’d exchanged after those services. Priscilla’s medical team planned to revisit in March the question of what program would be best for her. Meanwhile, they’d work on making resources to address “air panic” available for quick deployment if they were ever needed. Her home care nurse discovered that her doctor could actually write her a prescription for liquid morphine under justifying circumstances, so that became our contingency plan. In early March, Priscilla’s nurse practitioner told her, “I think you’ve got more than three weeks left, though I’m not sure you’ve got twelve.” (In other words, she might make it into June.) Nevertheless, her supervisor already wanted someone else to assume her role, because she wasn’t yet hospice-certified, and “end of life” issues were sure to arise soon. Priscilla didn’t want to lose this nurse practitioner. The home care nurse had found her when looking for someone who could write medical orders who would be able to visit regularly in person. We all agreed that she was exceptionally skillful and perceptive, and she’d become a friend to Priscilla as well. As a temporary compromise, Priscilla agreed to go into a local hospital’s pre-hospice program, which would add a hospice-certified doctor and nurse to her medical team without causing her to lose any of its other members. But when the program’s intake nurse interviewed her, she said, “Actually, we wouldn’t put you in pre-hospice. You’re the kind of patient we’d put right into hospice itself.” So that plan didn’t work. Finally the nurse practitioner’s supervisor came with her to see Priscilla. She recognized that she had a great team of capable people working with her and that she had a good relationship with all of them. The supervisor agreed that Priscilla would be well served by keeping each of these team members in place for as long as possible. Since her condition seemed stable, the question of the “best program” was put off again, to the beginning of June. When that month arrived, we let sleeping dogs lie, nobody else pursued the question, and the issue of hospice slipped quietly off the agenda. One night in late October 2014, Priscilla was awakened around midnight by pain spreading throughout her lower back. She couldn’t get back to sleep and at 4:00 she woke me up for help. I gave her a heavy dose of pain killers and we both slept a few more hours. Then we called her nurse practitioner and home health care nurse. They sprang immediately into action, because they’d already become concerned about her. The nurse practitioner had noted on a recent visit that Priscilla’s heart was beating rapidly. She’d suspected this was due to failing lungs: the blood was oxygen-poor, and so the heart was trying to send more blood around to deliver what oxygen it could. The nurse, for her part, had witnessed the decline in Priscilla’s breathing on her weekly visits and had already been thinking it was time to get her into hospice. She just hadn’t said anything to us about it yet because she knew families had to accept what this meant before they could consider it fairly, so she was waiting until we brought it up ourselves. The nurse practitioner got to our house as soon as she could and found Priscilla breathing rapidly and shallowly, with her heart racing. She called her supervising doctor and he agreed that Priscilla was likely “compensating” for oxygen-poor blood. But this was not sustainable. “Sooner or later she’s going to ‘de-compensate,’” he warned, meaning that the heart would become worn out by the exertion and slow down, leaving the body starved for oxygen. The heart might even stop entirely. The nurse practitioner later told us that she’d thought this could be the end. But it wasn’t. Somehow Priscilla’s body worked out a different way to “compensate.” (No one ever figured out exactly how; “our bodies are marvelous things” was the only explanation the nurse practitioner could offer.) She pulled out of the crisis, but it was agreed that she would need some new kinds of help. Priscilla had gotten the VPAP in April. Four months later, by August, the symptoms of carbon dioxide buildup had returned, so the respiratory therapist (RT) increased the pressure. Now, only two months further on, the symptoms were returning again (the back pain, for example). It seemed the weakening of the lung muscles was accelerating. The RT now recommended another pressure increase and switching the VPAP from “spontaneous” mode (responding when Priscilla initiated a breath) to “timed” (breathing for her if she didn’t initiate within a certain period). Her caregivers also felt that the pressurized air should be supplemented with oxygen. Priscilla agreed to give these measures a try, once she was assured that they’d only provide comfort and not artificially prolong her life. But she found that the oxygen dried out her throat and made her terribly thirsty, while the “timed” breaths kept waking her up. She decided she’d rather die during a good sound sleep, if it came to that, than suffer through thirsty, broken nights, so she went back to plain “spontaneous” breathing. Priscilla’s medical team now all encouraged her to enter a hospice program. This could be at-home hospice if she didn’t want to move into a residence. They explained that sooner or later, as her lungs weakened, she would experience “air panic”—the sensation that she was drowning—and that she’d need liquid morphine to turn off this signal to her brain. Home health care agencies didn’t have it; hospices did. “And you really don’t want to be without it when you need it,” they warned. By then it was early November. The entrance into home hospice was delayed as we investigated whether Priscilla could keep her current caregivers. Unfortunately, she couldn’t keep the nurse and aide from home health care, but she would be able to keep her case manager and nurse practitioner, who were contracted through our medical insurance, and the RT and mobility specialist, who “came with the equipment.” So the transition wouldn’t be completely disruptive. By the time this was settled, caregivers were already shuffling their schedules to accommodate Thanksgiving and Christmas vacations. “You might as well wait until the new year,” the aide advised Priscilla. “That way you’ll get your ‘regulars,’ and you’ll only have to train them once.” Her condition was stable at this point and this seemed a safe enough course. But we did do all the preliminary paperwork so that Priscilla could go right into home hospice in the first full week of the new year. Once again, she almost didn’t make it. In mid-December she had another episode in which she started hyperventilating, and this time she was also shaking uncontrollably. We still had the supplemental oxygen, but it made no difference. Somewhat desperately we called our home care nurse, who was supposed to come by sometime that day. “I’m parked right outside your house!” she told us. She’d arrived the moment we needed her. She consulted the nurse practitioner and they figured out how to bring Priscilla’s symptoms temporarily back under control. But they had to find out what had caused them in the first place, to prevent any recurrences. A battery of blood tests ruled out the most likely possibilities, such as an infection. This left, as the probable culprit, a somewhat rare but well documented complication of ALS, “autonomic dysregulation.” The disease, especially in its late stages, can affect the branches of the nervous system that control things like heart rate, breathing, and involuntary muscle actions such as shaking from cold. Autonomic “storms,” like the one Priscilla had just had, could be triggered by poor oxygenation. She’d had a shower earlier that day and the exertion may have been enough to cause this. So she was walking a tightrope. ALS was weakening her lung muscles, but her autonomic nervous system was mysteriously improvising some effective response via heart rate, blood pressure, respiration rate, etc. to keep her body oxygenated. At the same time, the disease was also throwing off this very system that was otherwise keeping it at bay. I discovered that autonomic dysregulation is implicated in the sudden death of ALS patients, most often at night, due to things like a catastrophic drop in blood pressure or a sudden cessation of breathing. The RT had told me earlier that she’d discovered, by downloading the data from the SD card in Priscilla’s VPAP, that she had “central apnea.” I’d wondered why she kept her voice low until I did some research and discovered what this was. Obstructive apnea, the kind we are perhaps most familiar with, is when you can’t breathe, because of a blockage of some kind; central apnea is when you simply don’t breathe. In the night, Priscilla’s breathing had been stopping for anywhere from 20 seconds to 2 minutes at a time. At any point it might have not started again. “You look terrible!” Priscilla exclaimed when I came into her office one day in September 2014. Earlier that day I’d helped the home health aide give her a shower, but I’d also rushed in and out of my own office whenever I wasn’t needed, furiously trying to finish a freelance editing project. I’d gone back to the edit once I got Priscilla settled at her computer, but the fact that I was “pushing” to finish showed clearly in the drained look on my face that she recognized with alarm the next time I walked into her office. We realized that trying to do freelance jobs was wearing me out when added to overwhelming daily care responsibilities and long-term accumulating fatigue. We wondered how much longer I should keep accepting these jobs. The answer came a couple of weeks later. It was a day when no one was supposed to come in or out, so I expected to have plenty of uninterrupted time for freelance work. But as I sat down hopefully at my desk, the phone rang twice in succession. Priscilla’s nurse practitioner and home care nurse were following up on some symptoms that had concerned them. Over the course of the day they each came in for complicated, extended sessions, and a friend also kindly but unexpectedly dropped by for a visit, bringing something she’d baked for us. Throughout the day I kept trying to return to the freelance project, but several times, literally just as I was sitting down and saying, “Finally I can get to some editing,” I’d be interrupted again. In the end, I did one paragraph for the whole day! “It was an awful day,” I wrote in my journal, but it was also a very helpful day, in that it showed me I could no longer promise clients in good faith that I’d be able to meet specific deadlines. That settled the matter. There could be no more freelance assignments after this one. We explained the new situation in an email to the group of people we had started calling our Dear Praying Friends (from my usual salutation). We asked them to pray with us that I’d somehow get this last edit done. It took another couple of weeks of hard slogging, but I was able to submit it by the original deadline. God had us covered for the income we would now be missing. A little earlier in the year, many of the people Priscilla referred to as her “Williams kids” (because we’d first met them when they came to our church as students at Williams College) had gotten together and collected a significant gift for us to live on in just such an eventuality. “We want you to have as much time as possible together,” they explained. Their wishes would now be fulfilled. My time with Priscilla would be both quantitatively and qualitatively greater now that I’d no longer have to look over my shoulder at looming freelance deadlines. Over the next year and a half, other friends additionally provided for us very generously, so that I was able devote myself full time to Priscilla’s care for the rest of her life. I can’t put into words what a magnificent gift this time together was and how grateful I will always be for it. For example, at one point Priscilla accidentally backed her power wheelchair into a framed watercolor of orchids that her brother had done for her. She cherished this painting and we’d hung it in a low (and thus vulnerable) spot because she wanted to be able to see it from her “day bed.” The painting fell off the wall, the frame broke, and the glass shattered. But who better than an artist—our new helper—to take it in and get it reframed? Hearing that we now had her coming in regularly, some other friends sent us a generous gift specifically earmarked for “household help,” to cover her well-earned wages. The watercolor painting that Priscilla’s brother did for her. But all of this nearly didn’t happen. The doctors had predicted that Priscilla would likely die by the fall of 2014, and she almost did. In my next post I’ll explain what happened.